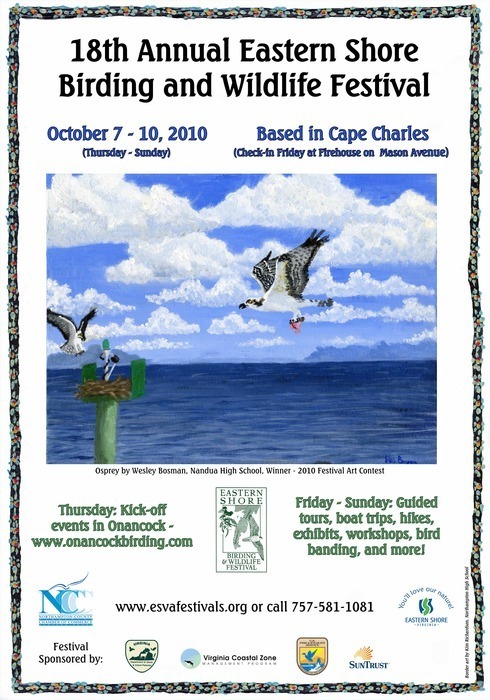 The Eastern Shore Birding and Wildlife festival celebrates its 18th years this fall. The festival will be headquartered in the bayside Town of Cape Charles in Northampton County. Birders and wildlife enthusiasts flock to the Eastern Shore to witness an amazing natural spectacle as countless numbers of shorebirds, raptors (including of course bald eagles) and songbirds pour along the Delmarva Peninsula in their fall migration. The festival offers the opportunity for birders to have expert guides lead them to some of the best birding sites on the shore, many of which are not typically open to the public.